Boating, skiing and swimming rules and regulations are vital to the safety of everyone on the Lake. 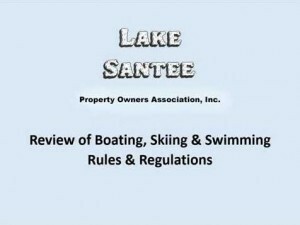 Please review the Lake Santee Rules and Regulations, by clicking on the video to the right or the link to the document below, so everyone can have a happy and safe summer on the water. Please review this link and help protect Lake Santee. The Lake is well known for bass fishing and is stocked annually with a variety of fish. It is an excellent fishing lake with largemouth bass, smallmouth bass, hybrid striped bass (wiper), walleye, black crappie, blue gill, catfish and others. The Lake Santee Bass Club holds Team Bass Tournaments from April through September of each year. 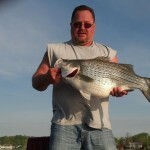 7.1 Only members of the Association in good standing and their invited guests will be permitted to fish in Lake Santee. Guests must be in the company of a member. 7.2 Largemouth Bass: no fish less than 21 inches shall be removed from the lake. Daily bag limit is set at 1 fish per day. 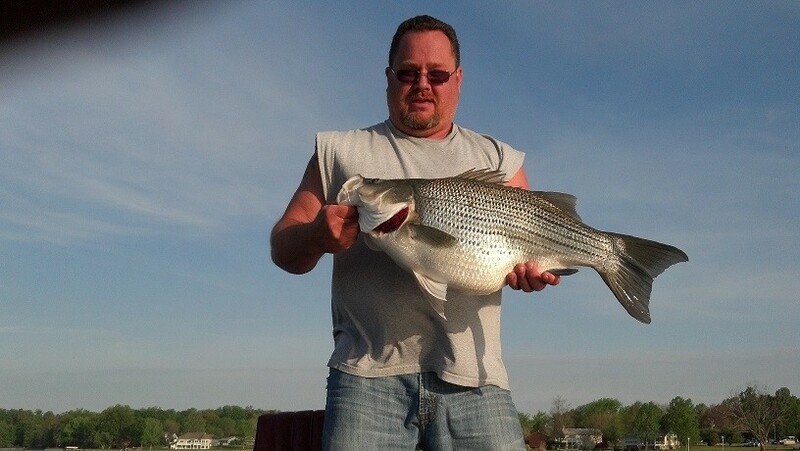 7.3 Hybrid Striped Bass: no fish less than 21 inches shall be removed from the lake. Daily bag limit is set at 1 fish per day. 7.5 Crappie: daily bag limit is set at 25 fish per day. 7.6 Redear Sunfish: daily bag limit is set at 15 fish per day. 7.8 The following baits are prohibited: gold fish minnows, red hoarse suckers, or carp minnows. 7.9 Trot lines and jug fishing are prohibited. 7.10 No fishing tournaments or contests will be permitted without prior approval of the Board of Directors. 7.11 Members may use a cast net to collect live Gizzard Shad for use as bait fish. 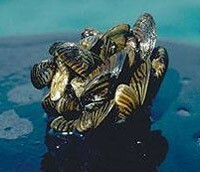 Any live Gizzard Shad collected and not used as bait fish must be killed and not returned to the lake. Cast nets may not be used to catch sport fish. 7.12 The use of minnow seines are prohibited on Lake Santee.